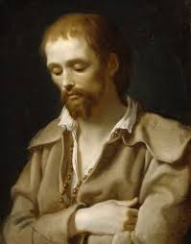 Benedict Joseph Labre was truly eccentric, one of God's special little ones. Born in France and the eldest of 18 children, he studied under his uncle, a parish priest. Because of poor health and a lack of suitable academic preparation he was unsuccessful in his attempts to enter the religious life. Then, at 16 years of age, a profound change took place. Benedict lost his desire to study and gave up all thoughts of the priesthood, much to the consternation of his relatives. He became a pilgrim, traveling from one great shrine to another, living off alms. He wore the rags of a beggar and shared his food with the poor. Filled with the love of God and neighbor, Benedict had special devotion to the Blessed Mother and to the Blessed Sacrament. In Rome, where he lived in the Colosseum for a time, he was called "the poor man of the Forty Hours Devotion" and "the beggar of Rome." The people accepted his ragged appearance better than he did. His excuse to himself was that "our comfort is not in this world." On the last day of his life, April 16, 1783, Benedict Joseph dragged himself to a church in Rome and prayed there for two hours before he collapsed, dying peacefully in a nearby house. Immediately after his death the people proclaimed him a saint. He was officially proclaimed a saint by Pope Leo XIII at canonization ceremonies in 1883.